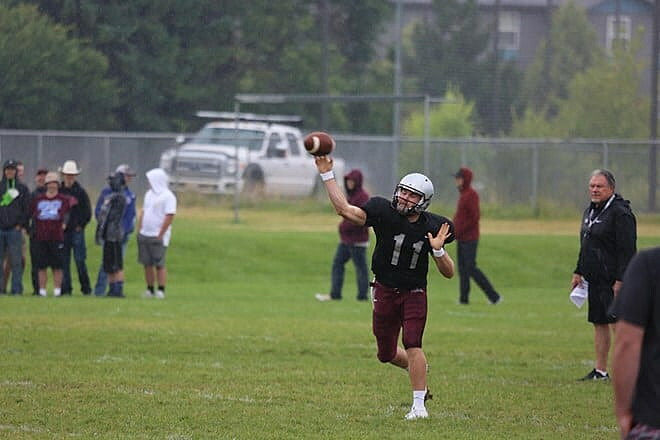 The Montana Grizzlies returned to the practice field on a soggy Monday afternoon, with steady rain pouring down during the entire duration of the two-hour session. Like many Montanans, the rain was a welcome sight for the Griz, who have battled through near record-breaking heat for most days of fall camp thus far. But they didn’t let it slow them down. Following the practice, head coach Bobby Hauck said he liked what he saw, despite the less-than-ideal football conditions. “It’s an outdoor game, you’ve got to play in whatever conditions are there on game day, and they did exactly that today. It was a good practice,” said Hauck. Monday’s practice was the Grizzlies first since running-through a closed-door scrimmage on Saturday, with the team taking Sunday to rest the bodies. With 12 days before the Griz open the 2018 season against Northern Iowa, the Griz emerged from Saturday’s scrimmage with more live reps under their belts, and a re-fueled energy level headed into the home stretch of fall camp. “We came out and had one of our better practices of camp, so I think the day off probably helped them. They came out ready to play today,” Hauck added. The Griz will return to practice on Tuesday at 2:30 in predicted drier conditions at Dornblaser Field. On Wednesday the team will hold a morning practice session (10:30 a.m.) to make room for the Great Griz Encounter that afternoon. Thursday’s practice schedule returns to normal with a half-pads session at 2:30 in the afternoon. The Griz will hold their final scrimmage of fall camp on Friday, Aug. 24, which is closed to the public. On Sunday, Aug. 26, the Griz will lend a hand to the campus community, helping new University of Montana students move into the dorms ahead of the first day of classes on the 27th. Fans will get the chance to meet the Griz this week as Washington-Grizzly Stadium gets set to host the annual Great Griz Encounter for the first time, giving them the chance to have this year’s team poster autographed and watch Black Panther on the Griz Vision jumbotron. Fans may also pick up the latest Griz gear from officially licensed apparel vendors and enjoy a wide selection of local food and beverages while taking in the atmosphere at one of the best college football settings in the nation. The fun begins at 5 p.m. when gates to the stadium open, followed by the introduction of the football and volleyball teams at 5:30. The two teams will sign autographs from 5:45-7 p.m. and the movie will start at 7:30. Due to a large number of fans wishing to get autographs, there is a two-item limit. M Store, Universal Athletic, Destination Missoula, Kettle Korn, Cruz Tacos, Covered Wagon and Badlander (non-alcoholic beverages, beer & wine only). Fans are encouraged to bring blankets or small lawn chairs to sit on the field for the movie. Water bottles are permitted. NO GLASS WILL BE ALLOWED.